As evidence of the above, we have Hurricane Harvey as a case in point. While elected officials blather about “zero-carbon” footprints, nothing is done to prepare for weather events that have happened before and can always happen again. International accords and conferences like the last one in Paris do nothing for a vulnerable place like Houston. Consider this article A Texas newsroom predicted a disaster. Now it’s close to coming true. published at Columbia Journalism Review. Excerpts below. THE TEXAS TRIBUNE AND PROPUBLICA last year published a multi-part investigation looking at what would happen if Houston was hit by a major hurricane. The reporters partnered with scientists at several universities in Texas to conduct simulations, gaming out various storm scenarios for the country’s fourth-largest city, with its rapidly growing population, huge stores of oil and natural gas, and a major NASA facility. The conclusion: The city and region were woefully unprepared for a major hurricane, with inadequate infrastructure for evacuation and flood control. A major storm would inflict catastrophic damage, bringing “economic and ecological disaster.” The series won awards, including a Peabody and an Edward R. Murrow, but it didn’t lead to substantive policy changes or big new investments in infrastructure. 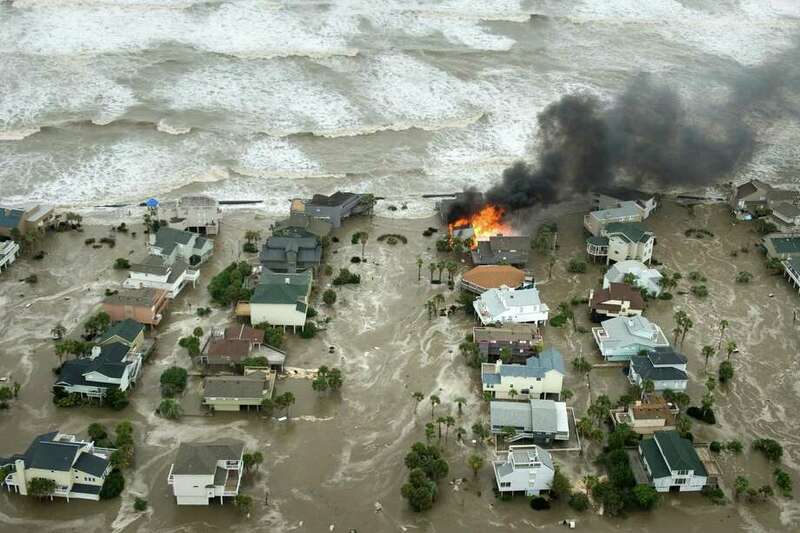 A house is engulfed in flames as water and waves inundate homes on Galveston Island as Hurricane Ike approaches the coast Sept. 12, 2008. Now the same journalists are watching nervously as Hurricane Harvey inches closer to the Texas shoreline. While landfall is expected between Corpus Christi and Houston, one of their worst-case scenarios could still come true. “Unfortunately it might take a disaster,” Shaw adds, “before Texas wakes up and realizes we need to send some real money to protect one of the nation’s biggest ports, where we keep most of our oil and chemicals.” If Houston was directly hit by a storm of Harvey’s magnitude, Shaw says, the environmental damage would exceed the BP Deepwater Horizon oil spill. After the series appeared, the reporters reached out to the state’s entire congressional delegation and both of its US senators, one of whom, Ted Cruz, ran for president. “So none of them can say nobody could anticipate the calamity a large storm could inflict upon their constituencies,” Klein wrote. A short video explaining in 2011 how to protect the area from the next big one. While elected officials blather about “zero-carbon” footprints, nothing is done to prepare for weather events that have happened before and can always happen again.